Muslin and Wood, 8x8x8 feet. 2018. This piece examines how architecture can be a religious motif. Morehead Planetarium, built in 1949, is rooted in religion. Above the entrance rests a Psalm: “The Heaven’s declare the glory of God and the firmament sheweth by His handiwork.” The inscription and the building’s neoclassical features memorialize a longstanding practice of the natural sciences as an act of worship. While the exploration of science is now a secular endeavor, the religious undertones still linger in the architecture. For this installation, I studied the history of Alderman Residence Hall and Carr Building (a former residence hall at UNC). I created designs featuring the faces of Carr, Alderman, and their respective buildings. By juxtaposing archaic imagery with contemporary technology, I invite the viewer to question the interaction between past and present. The digitally rendered collages are projected from overhead projectors within the residence hall. Residents and any passerby can scan the QR codes to learn about the history of the buildings and the people UNC memorializes. 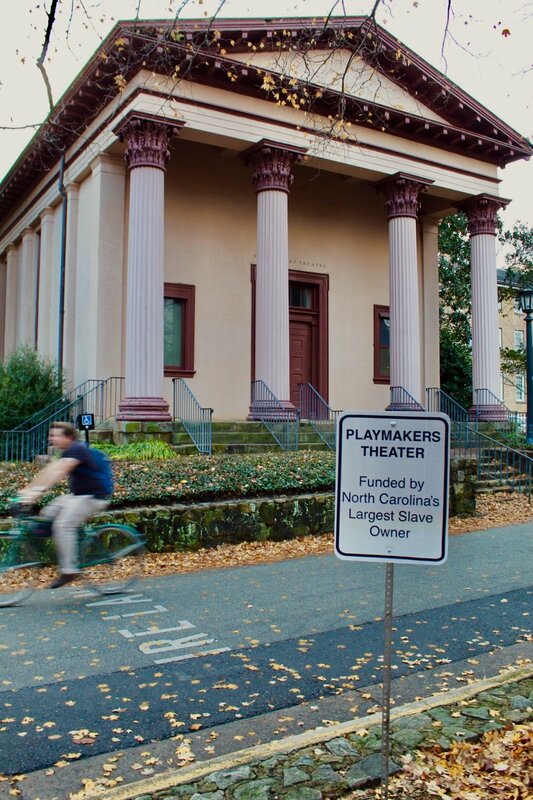 For this public artwork, I studied the history of Playmakers Theater, Clark Cheek Building, and the Old Chapel Hill Cemetery. All three of these locations are steeped in social injustice. For instance, the cemetery’s African American section was used for football tailgating through until 1970s. I fabricated signs that mimic existing DOT markers, appearing homogeneous within the location until further inspection. Created as part of a group exhibition, Monumenta, I designed and constructed this piece, to create an incomplete list of people the university does not honor. In the midst of political tension on UNC’s campus, many people are calling to question the monuments around campus and who UNC choses to memorialize. This anti-monument takes the form of a transparent plexiglass plinth. The list of unsung heroes is laser cut on plexiglass, making reading the list an intimate and introspective experience.